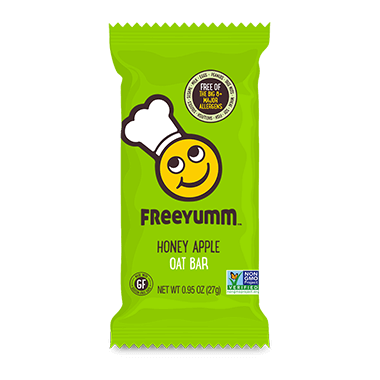 A delicious combination of whole grain rolled oats, organic apples, sunflower seeds, vanilla and cinnamon blended with pure maple syrup and honey, their Honey Apple Oat Bars were created to satisfy all your cravings. A wholesome snack for your little ones at recess, or a quick and convenient boost for you on-the-go, these allergen-free bars give you lasting energy, and you’ll love the taste, too! 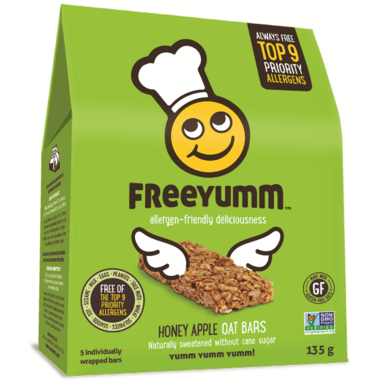 All FreeYumm products are made in their dedicated allergen-free bakery and designed specifically to protect you, your family and your friends living with food allergies. Ingredients: Rolled Oats, Oat Flakes, Honey*, Maple Syrup, Sunflower Oil, Coconut Palm Sugar*, Oat Flour, Dried Apples, Sunflower Seeds, Ground Flaxseed, Vanilla Extract*, Salt, Cinnamon. *ORGANIC. My grandsons favourite stocked up as they were on sale. Yummy. Really apple flavored. The better sibling of the allery-free snack family. Love these bars! I tried all the flavors of this bar and I love them all! These are so good, my girls love them! My only complaint is they always want two!! As a Mom of a very picky little one it is often hard to find healthy packaged snacks for those times when you don't have time to bake something. This is one product that I know my kids will always enjoy and has few ingredients. Great product! These are amazing! So moist & full of flavour! Even my picky eater loved them!! I just received a sample bar in my order. These bars are delicious. Both of my sons also had a bite and wanted me to buy more! Please restock. These taste just like my mom's apple crisp, and I can eat them without getting sick. I'm ordering more now.